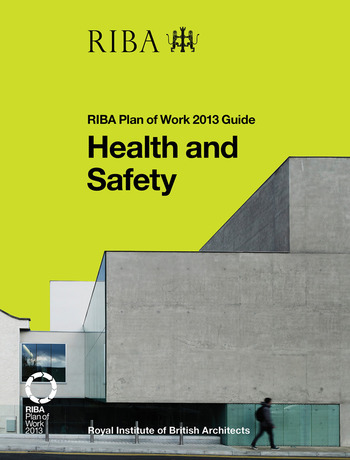 Health and Safety is part of a brand new series providing must-read practical guidance to running efficient and successful projects using the new RIBA Plan of Work 2013. Each guide takes a core project activity – in this case those associated with managing and integrating health and safety - and explains the essential activities required at each stage. Peter Caplehorn is the Policy Director and Deputy Chief Executive of the Construction Products Association. A chartered architect with more than 30 years of experience he works closely with the RIBA, BSI, BRE, HSE, and the Department for Business, Innovation and & Skills. He is the deputy chair of the Building Regulations Advisory Committee (BRAC) and currently chairs the British Standards Institution’s strategic committee for construction. His recent focus has been the new CDM Regulations, application of Building Information Modelling and future building regulations. Prior to joining the Association, Peter was the Technical Director at Scott Brownrigg, where he was responsible for all areas of technical compliance, regulations, health and safety and quality control. He has worked on a range of projects such as offices, housing, schools, industrial plants and airports. Peter chairs several major industry events and was central to the delivery of several British Standards and Publicly Available Specifications; for example, PAS 91 and BS 8560. Peter is the author of Whole Life Costing: A New Approach and has frequently published articles for the RIBA Journal, Building Design, Building and others.